LEF(t) — Critical Practices Inc.
LEF(t) Publications Standard Edition is a broadsheet publication printed in limited quantities and available free at new distribution points (globally). Each LEF(t) is themed and consists of a visual project and three text projects. The basic reasoning behind this is to sample the theme's multiplicity and complexity. Follow CPI on Facebook and Twitter to find out where you can pick up a copy. LEF(t) is and free for the taking. Bundles of 100 copies of each issue will be sent out to 15 Distributors around the world to be left at a site of their choice. The list of sites and distributors are not fixed. All issues published will not necessarily be available at any one location. LEF(t) Publications produces LEF(t) Standard Edition (SE), Special Editions (Sp.E), and un-Limited as well as some merchandise such as buttons, and collectables. LEF(t) Standard Edition is a 22” x 28” broadsheet publication in an edition of 2000 copies, published four times a year. Each issue consists of 3projects by writers andone full side visual project. Bundles of 100 copies of each issue will be sent out to 15 Distributors around the world to be left at a site of their choice and free for the taking. The list of sites and distributors are not fixed. Therefore, all issues published will not necessarily be available at any one location. 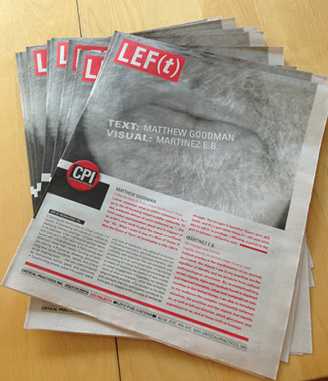 LEF(t) WB Special Edition’s stand is located in the Whitney Museum bookstore, allowing free access to the publication. An additional 400 copies will be distributed in quantities of 100 at locations in the other boroughs. The publication dates, table of contents, bios of the participants, and distribution sites will be announced via Twitter and Facebook. The construction of form varies greatly both in process and resolution. The development of these, are relative to the maker’s understanding of the social and cultural armature that circumscribe their practice. Authorship is evolving. New narratives and alignments across fields are being generated as conversations, collaborations, and dialogues are repurposed. Culturally, socially and economically we increasingly live in an instrumental (purposeful) and institutionalized (standardized) environment. As such all relationships come to be thought of as practical things meant to serve some pre-determined objective. Prompter: Michelle Grabner: artist, curator writer, co-founder with Brad Killiam of The Suburban, Oak Park, Illinois, and The Poor Farm in the Town of Little Wolf in Waupaca County, Wisconsin. Prompter: Sanford Biggers: interdisciplinary artist working in film/video, installation, sculpture, music, and performance. Lives and works in NYC. 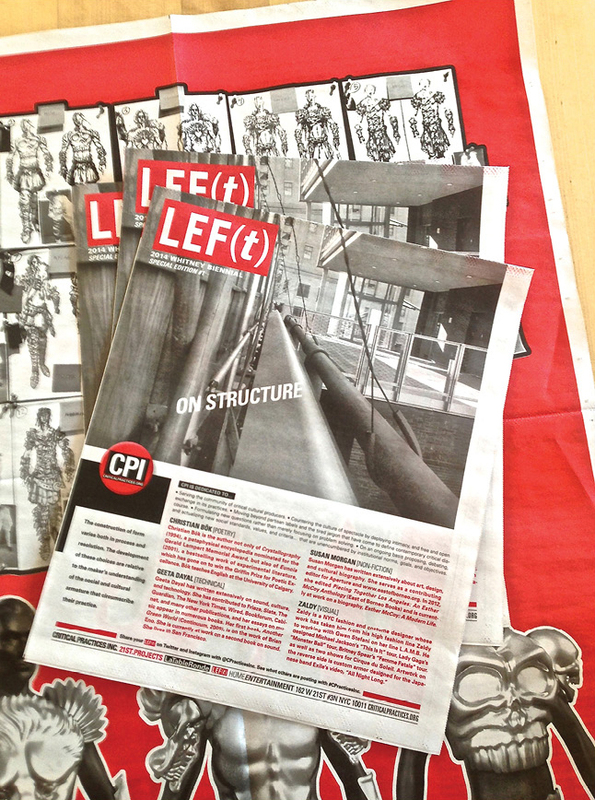 LEF(t) Publications is CPI’s public interface — as such it constitutes a social medium. LEF(t) Publications produces LEF(t), LEF(t) Special Editions, and LEF(t) unLimited. LEF(t) Publications takes its name from LEF (Left Front of the Arts) a Russian Productivist journal initiated by the poet Vladimir Mayakovsky and Isip Brik from 1923 to 1925. The italicized (t) in LEF(t) represents our means of distribution: copies of each issue will be sent out to Distributors around the world to be left at a site of their choice. LEF(t) is published as an edition of 2000, six times a year. Bundles of 100 copies of each issue will be sent out to 15 Distributors around the world to be left at a site of their choice. The list of sites and distributors are not fixed. Therefore, all six issues published will not necessarily be available at any one location. The locations corresponding to each distribution will be announced using social media — Twitter, Facebook, etc. These media will also supply CPI with a feedback loop. LEF(t) is a 22.75 x 28 inch newsprint broadsheet printed in black and white and one color. LEF(t) is printed on one side with text and on the other side a visual project. LEF(t) will present six types of writing: technical, non-fictional, fiction, script, poetry, and critical/theoretical. LEF(t) will present six types of visual projects: visual art, graphic design, architecture, fashion, digital interface, and set design. The pairing of text and image will be determined by chance means. The text will occupy three quarters of LEF(t)’s face page; the masthead occupies the upper left hand quadrant. The visual project occupies the reverse side. Unsolicited contributions will not be considered. 100 sets of complete editions will be distributed by other means and will also be available for purchase.